A vigil is scheduled for Thursday evening for a college baseball pitcher from San Mateo who was killed, reportedly while he was playing Pokemon Go. Private services for 20-year-old Calvin Riley, who was shot in the chest on Saturday in San Francisco at Fisherman's Wharf, will be held at 6 p.m. at St. Gregory's Church. The public is invited to a 7 p.m. vigil afterward. 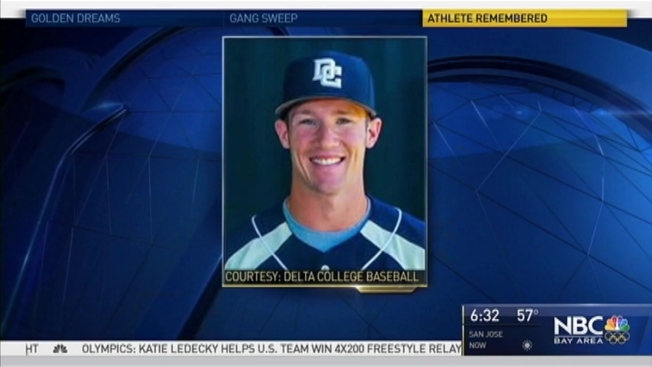 A funeral Mass will be celebrated on Friday at 11 a.m., also at the church in San Mateo, where Riley had attended Junipero Serra High School before becoming a student at San Joaquin Delta College in Stockton, where he was on the baseball team. The U.S. park police have not yet arrested anyone in Riley's death, and family and friends believe it was a random attack. According to a Go Fund Me page set up in Riley's honor, he was playing the popular Pokemon Go game on his phone at the time of the shooting. In a previous interview, family friend John Kirby said they were devastated. "Calvin got a few steps ahead of his buddy," Kirby said. "He went around the corner, and his buddy heard gunshots. It seems to be a random act of violence - for no reason." Anyone with information about the shooting is asked to call the U.S. Park Police tip line at 415-561-5150.